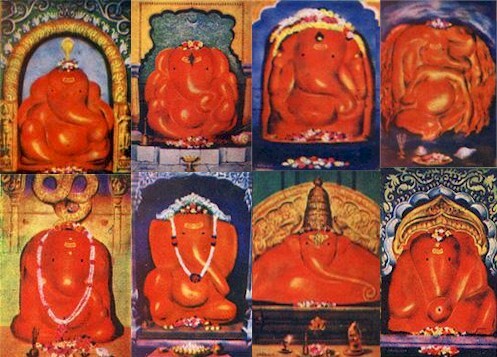 The Siddhi Vinayak temple at Siddhatek is located at a distance of about 200 km east of Pune. Siddhatekcha Shri Siddhi Vinayak is considered to be one of the Ashta Vinayak shrines of Maharashtra, celebrating eight instances of legends related to Ganesha. Legend has it Mahavishnu who was engaged in a serious battle against the demons Madhu and Kaitabha, was dismayed by his inability to bring the battle to a quick and decisive finish. Shiva advised him to propitate Ganesha. Upon doing so, Ganesha appeared on the battlefield, and his appearance strengthened Mahavishnu's resolve and abilities and enabled him to vanquish the demons with ease. Ganesha's appearance on the battlefield is marked by the Siddhivinayak shrine at Siddhatek, said to be capable of granting Siddhi. Mahavishnu is worshipped as the destroyer of the demons Madhu and Kaitabha at Tiruvallur near Chennai in Tamilnadu, and as the restorer of the Vedas from the same demons, at Indalur in Mayiladuturai near Thanjavur again in Tamilnadu, both these temples being over 1200 years old. The Temple: The Siddhatek Siddhivinayak temple is a hill temple, built by Maharani Ahilyabai Holkar, who is also credited with rebuilding the Vishnu Pada temple at Gaya, the Vishwanath temple at Benares and several other temples. Ganesha is enshrined in a seated posture with his consorts Siddhi and Riddhi.